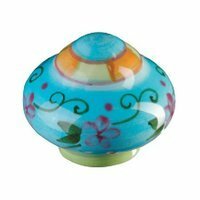 Siro Designs, Blue Center With Orange And Green available at MyKnobs.com everyday low prices. The Siro Cabinet Knobs are really beautiful. The look just like the picture on their website. The site was easy to navigate and well done. Shipping was quick and packaging was excellent. Again the knobs were perfect. I would recommend this company anytime. I will be using them as my regular replacement knob and pull company. Keep up the good work MyKnobs.